Holds regular (letter) size paper. You can order this item in Durable Plastic (index - P) which is more break-resistant than acrylic, lighter and more flexible, it is easier to clean, but it is less scratch-resistant than regular acrylic. To order on-line just select Plastic Type as "Durable Plastic - P". 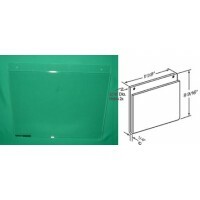 To order over the phone please don't forget to specify the index - P.
SH-119 Horizontal Display Holder, Heavy Duty Holds regular (letter) size paper, 8½" X 11". You ca..